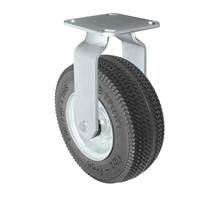 AIR FILLED - Plate Size - 4" x 4-1/2" FOAM FILLED - Plate Size - 4" x 4-1/2"
Caster HQ's pneumatic casters are air filled pneumatic wheels. 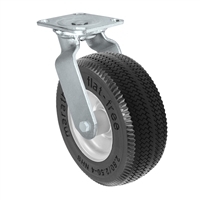 Air filled pneumatic caster wheels provide a shock absorbing, cushioned ride with a quiet operation. Foam Filled Pneumatic Casters or our Pneumatic Caster Alternative. Please contact us for a recommendation if you need pneumatic casters to be moved with mechanically powered equipment. Mounting Plate: 4" x 4-1/2"